Queen Victoria was such a fan of carved cameo jewelry that she inspired a mass-produced cameo trend by the second half of the 19th century. 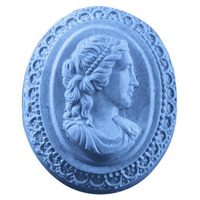 The richly detailed Guest Cameo Soap Mold depicts a striking Roman woman in a beautiful frame. Bar Depth: 1" Bar Length: 2"
Queen Victoria was such a fan of carved cameo jewelry that she inspired a mass-produced cameo trend by the second half of the 19th century. 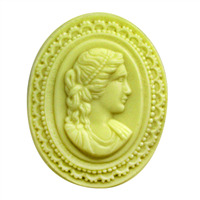 The richly detailed Cameo Soap Mold depicts a striking Roman woman in a beautiful frame. Geisha are traditional Japanese female entertainers who act as hostesses. 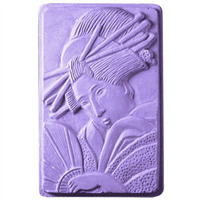 Our Geisha soap mold is a beautifully intricate rendering of an 18th century geisha, sporting a shimada hairstyle and wearing a kimono.